Once again, our Summer Open Show will be held at Milton Community Centre, Milton, Cambridge CB24 6BL. Judges are Wendy Starkey (Miniatures) and Jackie King (Standards). Cindy Dare will judge Best in Show. 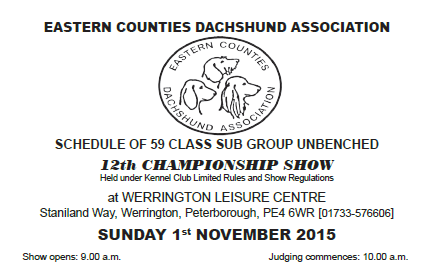 Please note that AV Miniature Dachshund and Junior Handling will now be judged by Wendy Starkey. Visitors with Spectator Dogs are welcome. The AGM will take place after the show. New Venue; 2012 Entry Fees. Show opens: 9.00 a.m. Judging commences: 10.00 a.m.
Download the Schedule and Entry Form for our 2nd November Open Show to be held in Milton, Cambridge. 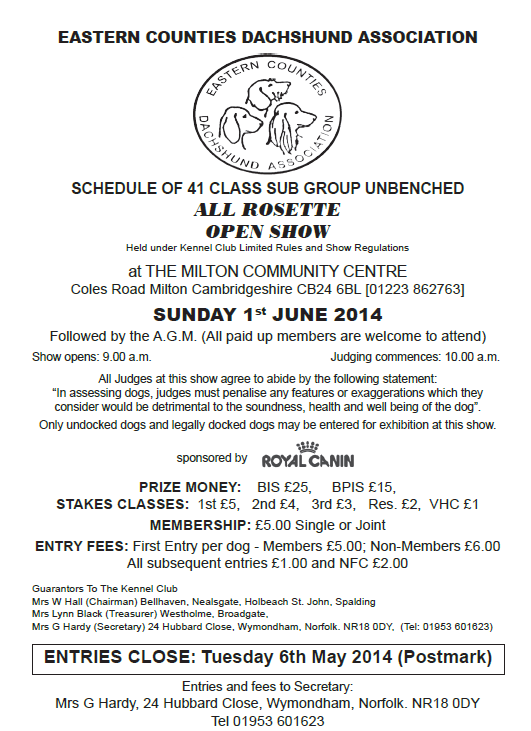 Just to remind you that entries close on Tuesday 6th May for ECDA Open Show at Milton on 1st June. Schedules can be downloaded here. Note: Change of Judge: Christine Russell will now be judging all the Minis and the Standard Stakes classes.